Chateau St. Jean wines are available everywhere--at least in LA. In the supermarkets, CostPlus, and of course in every pallets section of every Costco in the greater metro area. I recently picked up a bottle of their 2004 Fume Blanc from Sonoma County, and it turned out to be a good QPR wine with a 60s, retro feel to it. What, you might ask, is fume blanc? It's actually a term unique to America, coined in 1968 by the legendary Napa winemaker Robert Mondavi, to describe a dry, oaked sauvignon blanc. Modeled after the Loire's Pouilly-Fume, the fume blanc wines were intended to be smoky, inflected with the taste of minerals, and elegant. They are a far, far cry from the New Zealand style sauvignon blancs popular today, with their tangy, grassy, and citrus flavors and aromas. Back in the 60s, though, this was as trendy as could be when it came to sauvignon blanc. 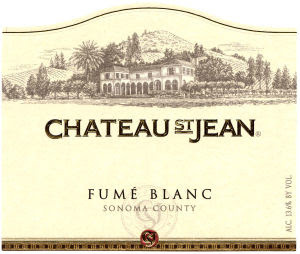 The 2004 Chateau St. Jean Fume Blanc from Sonoma County ($7.49, Costco) is pale straw in color. 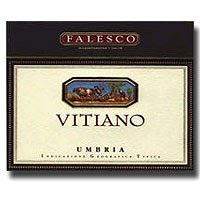 It has aromas of smoke and citrus, which are followed by round flavors of melons, citrus, pear, and oak. This wine was a little disjointed--the flavors didn't evolve smoothly, one into each other but seemed at times to almost fight for dominance. Initially, the smoke won out, and if you're going to try this you might want to open it a bit before you drink it and let some of the smoke blow off. As the wine sat in the glass, the melon and pear flavors began to move to the foreground. This wine might overwhelm delicate food, and I would recommend thinking of pairings that might work well with chardonnay, rather than sauvignon blanc if you want to serve this wine with dinner. I thought the wine would be perfect with a salad, so we had it with a suitably retro, only-in-California fusion salad of hotly contested origin--the Chinese chicken salad--updated by the folks at Sunset magazine to include more vegetables (asparagus and avocado). It was good with the wine, and I suspect that the wine would do equally well with other retro favorites (like chicken tetrazzini), or even a simple (and timeless) roasted chicken. Having this wine was another good reminder about wine trends and fashions. Soon the New Zealand style sauvignons will have to make way for something else--wonder what that will be? This is one of the true joys of being a wine enthusiast: no two bottles are the same, and the world of choices is always changing and evolving. Every now and again I just need to watch Moonstruck. I love the scenes in the Italian restaurant, the dinners at home, and the omnipresence of wine throughout the movie. And then there's the soundtrack. If you are in the mood for Italian-American food (spaghetti with meatballs, a pizza) a movie, and some amore, you might want to pick up a bottle of the very good QPR 2004 Forchini Papa Nonno red blend ($13.95, Chronicle Wine Cellar). Forchini Vineyards was started by up by Jim and Anita Forchini in 1996, after Jim had worked in the business as a wine maker for nearly two decades. (Previously he'd been a mechanical engineer--there is hope for us all!) The Papa Nonno is a tribute to Jim's grandfather Pietro Bernacchi, who arrived in the US from Lucca, Italy in1908. 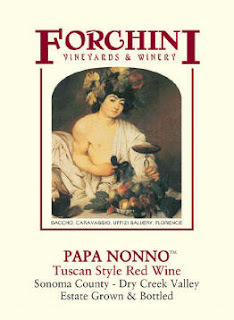 The 2004 Forchini Papa Nonna ($13.95, Chronicle Wine Cellar) blends together red and a small amount of white grapes. With 58% Zinfandel, 27% Cabernet, 11% Carignane, and 4% mixed whites--nearly all from grape vines that are 50-90 years old--I found this to be a soft, medium-bodied wine. It was deep, inky garnet in color. I didn't get much aromas, just a little bit of red fruit and spice. Flavors of blackberry and brambles from the Zin were accompanied by mild spiciness and dusty tannins from the 19 months the juice spent in American oak. I thought that the winemakers did a good job capturing the bright acidity of a Tuscan chianti, even if there wasn't a drop of sangiovese in the mix. We had it with a pizza margherita and salad, which was a perfect pairing, but it would be equally good with spaghetti and meatballs, eggplant parmesan, or any other Italian-American favorites. The 2004 Papa Nonna has received several awards, including a Silver Medal from the 2006 Sonoma County Harvest Fair and a Silver Medal from the 2007 San Francisco Chronicle Wine Competition. If you can't find this wine near you, and you can accept direct shipments, the wine is available through the Forchini's own website. Buon appetito! With riesling moving steadily from the unfashionable to the fashionable side of the wine spectrum, and costs bound to follow from affordable to sky-high, perhaps it will soon be gewurztraminer's turn to take a spot in the bright lights. There are many similarities between Geuwrztraminer and Riesling--both can be off-dry, both pair well with ethnic foods--yet it can be difficult to find good gewurztraminer at affordable prices, not least because relatively little of the grape is cultivated here in the US. But there are good gewurztraminers coming out of California and Washington, including this one from the Columbia Valley. Winemaker Joy Andersen of Snoqualmie Vineyards in the Columbia Valley AVA of Washington state, faced a difficult vintage in 2004: hot and dry conditions led to early ripening and the beginning of grape harvesting, followed by a cold snap and a "second harvest" in October. From these challenging conditions sprang this good QPR Gewurztraminer, made from certified organic grapes. It's the organic status of the grapes--bare of pesticides and chemicals--that gives this wine its pure, "naked" character. The 2004 Snoqualmie Naked Gewurztraminer ($12.99, Malibu Wines) was golden straw in color. There were subtle aromas of pear and honeysuckle, but nothing like the perfumed spiciness that often accompanies a wine made with this varietal. I was struck by its slightly syrupy texture, which I enjoyed very much. It accompanied tastes of sweet apple and white peach, which finished with a honeyed note. Though it had many of the varietal calling-cards of gewurztraminer, I felt that it lacked the spiciness and the fresh acidity to bring everything into focus and produce a really memorable wine. We had it with a spicy stir-fry, but I think it would have been even better with very spicy Indian food or even Thai cuisine. The next day, I had a glass before dinner while I was just unwinding and it was an excellent aperitif, so it's worth thinking of this wine if you are having a drinks party. The 2004 may not be easy to find (although there were quite a few bottles up at Malibu Wines when I was last there), but there is a 2005 version of this wine out now. Feel free to leave a comment if you like gewurztraminer and would like to give us all a heads up on your favorite finds. I just had my first encounter with Burgundy that was not in a restaurant or at someone's house where I couldn't think about it properly. Recently I bought a selection of red Burgundies from Chronicle Wine Cellar, all of which were Vincent Girardin wines labeled for European markets under the "Baron de la Charriere" brand. This was my chance to start drinking them. What a good experience--and a reminder that we all benefit from getting out of our wine comfort zones once in a while, whether its drinking more/less expensive wines, wines from a different region, or wines made with a different varietal. We are creatures of habit, and it's easy to fall into ruts without realizing it. Cautionary note to all readers: I am not well-versed in Burgundian wines, so take this as "notes from a palate in development." I do drink a lot of US pinot noir, but this bottle clarified the differences between French and US style wines made with this varietal--just as there is with any grape. 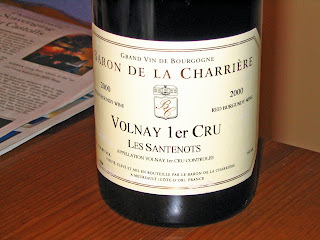 The 2000 Baron de la Charriere Volnay Les Santenots ($19.95, Chronicle Wines) was an excellent QPR wine. It was bright ruby in color with a richness and opulence that was very attractive. It had aromas of herbs and cherries that kept coming from the glass in waves, right down to the very last drops. Flavors of cherries, fresh raspberries, rare roast beef, and a mineral twinge kept this wine interesting. There was a nice juicy finish. My overall sense of this wine was balance: it was fruity without being jammy, velvety without being syrupy, lush without being over the top, with its elements kept in perfect symmetry. The miracles of podcasting made it possible for me to drink this wine while listening to part 1 of Grape Radio's interview with Allen Meadows of Burghound fame. It's an excellent show, and I learned a lot. If you are new to Burgundy, I recommend you check out this podcast from the American Wine Blog Award finalists at Grape Radio--even if you don't have a red Burgundy or pinot noir to sip with it. I wanted something rustic, earthy, and warming to go with this wine, so with Allen and the Grape Radio boys playing away through my favorite Christmas present--the IHome under cabinet iPod player--I started cooking some roasted pork with blue cheese polenta. You were supposed to roast the pork in the oven with fresh figs, but they aren't in season right now so I threw a couple of handfuls of whole button mushrooms in around the pork and they were a good substitute. (I also substituted a pork loin for the pork tenderloin in the recipe simply because I prefer that cut--you can, too, but it will take a bit longer to cook so use a meat thermometer to make sure it's done before you pull it out of the oven.) The blue cheese tang of the pinot was a perfect counterpoint to the cherry flavors and aromas in the wine, and I think roasted pork is always great with pinots. After this, I'm feeling much less generalized Burgundy anxiety. And I'm really looking forward to continuing to explore the wines of Burgundy. Bordeaux Step 5: Where the *&!% is Pessac-Leognan? OK, so you know you know you like Bordeaux wines, you understand that they're blended wines that are not going to taste like New World cabs or merlots, and you actually managed to find a cupboard/closet/unused fireplace where you can put several dozen bottles. You've got a merchant in mind, and now you want some Bordeaux. Then you read the labels. Confusion sets in and your resolve to try Bordeaux begins to crumble.It's like having a bad flashback to 9th grade geography. Where exactly is Pessac-Leognan, you wonder? How does this wine from Pessac-Leognan differ from the wine advertised beneath it, that is from Haut-Medoc? It's really nothing that can't be sorted out with a map and a chart (map right, chart below). The French appellation system (AOC) is strictly controlled and covers not only the geographical origins for grapes used in a wine, it also covers what grape varietals can be grown, how they can be grown, how wine is to be produced, and alcohol levels. There are over 40 AOCs in the Bordeaux region (map from Terroir-France, click to enlarge), each specializing in a handful of wines made in a handful of ways. Of course, the genius of the place and the talents of the winemaker make these wines taste different, despite all the precision and regulation. Most of the AOCs that produce red Bordeaux, and the most popular white Bordeaux like Sauternes, have varietal guidelines that can help you to make the best wine choices for your palate. Like the pencil lead and cassis of Old World cabernet? Head for wines from the Medoc, from St. Julien, or any of the other AOC that produce red wines made predominantly with that varietal. Prefer the softer, fleshier merlot blends? The Right Bank AOCs of Pomerol and St Emilion are for you. And if you like a balance between cabernet and merlot, the Pessac-Leognan, Entre-Deux-Mers, and Graves AOCs all produce wines that should suit your harmonious palate. Next week: professional tasting notes, how to read them, and how to use the classification system to help you sort through them in search of bargains. The theme for next month's Wine Blogging Wednesday has been announced. 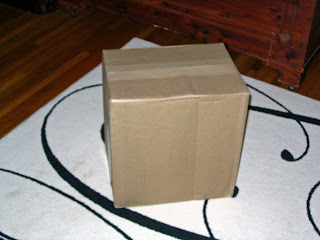 Hosted by Box Wines Blog, the brief is to pick a wine in a non-traditional package (box, tetrapack, goatskin--although I think that's the most traditional, isn't it? ), drink it, write up your tasting notes, and post them on March 14, sending a note to the hosts about your submission. For the full brief, click on the announcement link. Thanks to Sonadora at Wannabe Wino for giving me the head's up that this had been posted! In case you don't know yet, Tim Elliot's pipes burst right over his wine cellar which required some hasty use of saws and soldering irons, resulting in not only a hole in his cellar ceiling, but a smoldering rafter fire. Despite this (face it, it would have been enough to send most of us straight into the wine cellar for vino! ), he managed to pull together a wrap-up for last week's Wine Blogging Wednesday on New World Syrah that boasted the largest turnout in WBW history. I think that all these great write-ups from fellow wine lovers and bloggers will keep us rolling in shiraz and syrah for the foreseeable future. Thanks to Tim at Winecast, our fearless leader who bravely continued despite utter mayhem at home, and to all those who participated by sending in their notes. As soon as the theme for WBW #31 is posted, I'll be sure to announce it here. It's Valentine's Day this week--the time when you throw your New Year's diet out the window (if you haven't already done so), buy a box of chocolates, trawl supermarkets for flowers, and put together complicated dinner menus for the one(s) you love. And, even if you are averse to pink most of the year, you suddenly find yourself drawn to the color. Fulfill your need for the pink stuff by trying this N.V. Blason de Bourgogne Crémant de Bourgogne Cuvée Rosé Brut ($7.99, Trader Joe's). A companion bottling to the regular brut sparkler from this winery I reviewed for WBW #28, the rose brut is salmon pink tending towards rose in color. There is not much of an aroma, but what you can smell is slightly biscuity like toasted bread. Once poured, there is lots of froth/mousse, and the bubbles/bead is a little rough and rasping on the tongue. Flavors of raspberry, toast, and yeast come through as you sip this wine. Brut rose wines are not as common as blanc de noirs and other pink or pinkish sparklers that are softer in style. This is not the smoothest brut rose you'll ever have, but it is still very good QPR. And, if you like your wine brut and pink, this is the way to go. With this sparkler we had a fabulous pink pasta, as well, that I pulled off of Epicurious. Shrimp and bay scallops were tossed with garlic and oil, then added to a sauce made of tomatoes, clam juice, cream, and basil. This rich meal with its shellfish and tomato flavors responded very nicely to the brut wine, and of course it all looked fabulous together, too. If you are in the mood to bake, you can try your hand at this chocolate souffle cake from Cooking Light. It has a nice touch of orange from Triple Sec and deep, dark chocolatey gooey-ness and is surprisingly low in calories. It's a bit fiddly to make but you do need to make it in advance and refrigerate it, so you can hide all the work and whisk it out of the fridge, topping it with a dusting of confectioner's sugar and some orange peel at the last moment. Also: I think you could easily substitute 3 Tbs of Chambord for the OJ/Triple Sec and top with a smattering of raspberries if you want to stay on the pink/red/V-Day theme. Now onto the fun stuff: buying Bordeaux. There are two ways to buy Bordeaux. The first I call opportunistic (that is, you walk in the shop, see a bottle you want, and buy it), the second I call strategic (that is, you order wine as a future or pre-arrival and wait for up to two years to feel the bottle in your hot little hand). In both cases, however, it is absolutely crucial that you buy Bordeaux from a merchant that you trust. And, ideally, your merchant should be someone with whom you have developed some kind of a working relationship. You want to be able to ask questions, and to know that the answers are reliable. You also need to know that this is a merchant who is going to be around if there are problems with your shipment. Indeed, you need to feel confident this merchant will still be in business when your wine finally arrives long after you've paid for it. First, opportunistic Bordeaux buying. You can always go into your favorite wine merchant and ask them if they have any Bordeaux wines on the shelf. Some will have aged Bordeaux, and others will have freshly arrived Bordeaux that may or may not be ready to drink. It's important that you trust your merchant, in this case, because you don't want to buy older Bordeaux that hasn't been stored properly, or newer Bordeaux that hasn't been shipped and received properly. Who wants cooked Bordeaux? Not me. 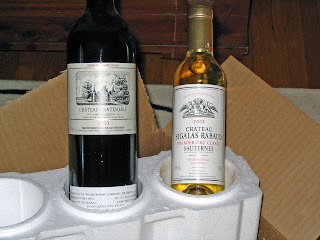 When it comes to strategic Bordeaux buying, trusting your merchant is just as important for reasons of storage and receiving, but you have to add to this the real worries that I always have about shipping. There are merchants that specialize in shipping wine, though, and it pays to find them. Often, big online merchants such as K&L have great selections and prices and I typically browse their futures and pre-arrival wines, find what I want, order them, pay for them, and then wait for them to arrive 18 months to 2 years later. 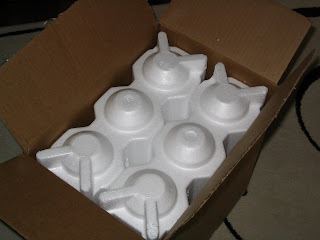 When they do arrive from K&L, I know that they will arrive in a sturdy box (picture 1), packed into styrofoam silos or some other packing material that provide some insulation from temperature changes as well as breakage (picture 2), and that I will actually receive what I ordered (picture 3). I have a long relationship with K&L and had received lots of wines from them without any problem for almost 10 years before I started buying Bordeaux futures. They have excellent customer service, too, as Vivi's Wine Journal reported back in November. On the east coast, I've ordered wines as gifts for family out there from The Wine Library in NJ and I've never had a bad experience with them, either. The wines are always correct, they always arrive in impeccable condition, and I've experienced great customer service during the order and delivery process. Simply put, finding a merchant that you know and can trust takes a lot of anxiety and stress out of buying Bordeaux. If you have any recommendations for Bordeaux merchants in your area, or online merchants that you have used, please leave a comment and let us all know. Beginning next week: the final three posts on the research you need to do to make the best buying choices. Do you know what you're serving your sweetie in the wine department for the upcoming Valentine's Day festivities? Something romantic, for sure. But how about a wine that is not only romantic, but organic and biodynamic, too? One publication is urging you to consider "responsible hedonism" as the theme for your celebrations this year. The good folks at Organic Wine Journal have just released their dozen picks from among organic and biodynamic wines. They include sparkling, rose, white, red, and dessert selections and there are even food pairing suggestions to help you pull it all together. I was particularly drawn to the Brüder Dr. Becker 2004 Scheurebe Sekt Extra Trocken from the Rheinhessen in Germany (available from Crush Wine and Spirits for $22.99 or Smith & Vine for $20) with its pink grapefruit flavors to go with lobster, as well as the Mas Amiel Maury 1990 from the Languedoc-Roussillon region of France (available from Appellation Wine and Spirits for $44.99) . This is a yummy port-style dessert wine made with grenache grapes that would go perfectly with chocolate. Though more than $20, it's still cheaper than a dozen roses and probably will last longer, too! If you don't know the Organic Wine Journal, you should swing over to their site and take a look. They've got some great articles up now about Demeter Certification for biodynamic producers, and another on the use of organic grapes in New Mexico. Clicking on their logo, above, will take you to the home page, and the links above lead directly to specific articles. Tom Wark at Fermentation has announced the finalists for the 2007 American Wine Blog Awards, the first awards dedicated to wine bloggers (as distinct from food and drink bloggers). There are lots of familiar names in the categories, but also some that you might not know yet so take some time to do a fair evaluation of all the finalists before voting. Click on the logo to the left to be taken to the survey. You can only vote once, thank God--none of that crazy vote once a day nuttiness--so take your time and think about it. Not sure when the voting stops, but if I find out I'll let you know. Update: voting ends Friday, February 16. This is a great chance for those of us who read and learn from bloggers to make a point about the power of the medium and the quality of what is produced by the very best among us. Thanks once again to Tom Wark for conceiving of the awards, and handling the process so impeccably and promptly. Gruet Winery is located near Truth or Consequence and Albuquerque, New Mexico. Yes, New Mexico. Back from London, and impressed with the geographical range of wines in their supermarkets, I decided to pop the cork on a wine from a region in the US I've never had before. Moldavian wine is no doubt grand, but how about New Mexico? I learned from Appellation America that the first grapes planted in the US were in fact planted in New Mexico, way back in 1639 by Fray Gracia de Zuniga. Floods of the Rio Grande between 1880 and 1900 destroyed much of the 3,000+ acres of grapes that had been cultivated over more than two centuries, and it was only in the 1970s that the area started coming back into its own as a grape producing region. I was impressed with this very good QPR sparkler from grapes grown 4300 ft. above sea level in the dry air and sandy soil of the region. The NV Gruet Blanc de Noirs ($8.99/375ml, Mission Wines) was pale copper in color. Though it had small bubbles (aka bead) it had lots of froth (aka mousse). There were nutty and apple aromas at first, and as you drank you tasted hazelnuts, apple, and even a touch of berry. This was a nice example of a brut blanc de noirs, that was not harsh and that had much more complexity than many at this price point. We had this with a simple chicken and shrimp stir fry with brown rice, and it nicely picked up the nuttiness of the rice. There is a lot of the Gruet available throughout the country, according to Wine-Zap, and in many places the 750ml bottles are under $15. The little splits like the one I had are also good to have on hand for pouring a glass or two when you don't want to make a commitment to a whole bottle of bubbly. One of my New Year's wine resolutions was to drink more sparkling wine, and opening this bottle was proof that this is going to be one resolution that's easy and fun to keep! I've been in London doing some work, and decided to go out and find what folks in the UK are drinking wine-wise. It's a bit heretical not lifting a pint in a pub--and I do love British beer and cider--but the lure of a Waitrose was too much for me, so it was into the wine section of a nearby supermarket that I went. 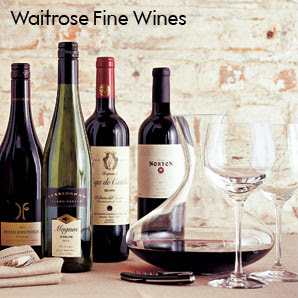 Waitrose is an up-market grocery chain that you can find throughout much of the UK. It's known for its wide selection of food and wine, and the wine section was certainly as good as those in the most expensive, super-selective US grocery chains. Plus, you can pick up a handy catalogue of all the wines currently on offer, order cases online, and a lot more that special services that supermarkets over in the US don't offer their wine-buying customers. Glancing through the shelves I was struck by the geographical scope of the wine selections. They had wine from Lebanon, Israel, Greece, Moldavia, and Hungary as well as Chile, Argentina, South Africa, and Austria. Europe's everyday wine culture meant that there were abundant interesting wines--and nearly all of them were less than £20, which in terms of buying power is about $20 (a small cappuccino at Starbucks is £2.89, for comparison's sake) The other thing I was struck by was the preponderance of screwcaps--they were on practically everything, including wines from Burgundy. So what did I sample? I got a 2005 Bouchard Aine et Fils Bourgogne (roughly $16 at this rate of exchange, under a screwcap), which was a brightly cherry-colored red with a nice mixture of fruity and earthy aromas and flavors. I also sipped my way through a 375-ml bottle of sweet vouvray, the 2005 Chateau Gaudrelle Vouvray Reserve Speciale (roughly $18) with flavors of caramelized bananas that struck a good balance between sweetness and acidity. And finally, a truly amazing 2006 Diemersfontein Pinotage from South Africa that practically knocked you out with its double-espresso and bitter chocolate aromas and flavors (roughly $16, under a screwcap). Though you won't find a single one of these wines in the US, they were eye-opening to me, not least because of their low, low cost and high, high value. Given the fact that the buying power of the pound is roughly that of the dollar (though the exchange rate is not favorable right now at nearly $2.00 to £1.00), at just £7.99, £8.99, and £7.99 respectively, they were all genuine bargains in my book. Maybe in time US grocery chains will be offering the services to wine consumers that are available in the UK at Waitrose? And how about some more Lebanese wines?? I had never even heard of grenache blanc when I wandered into Malibu Wines last month and saw this bottle on offer. Made by Kris Curran, the winemaker at Sea Smoke, on her new personal label, there are fewer than 100 acres of grenache blanc under cultivation in the US. 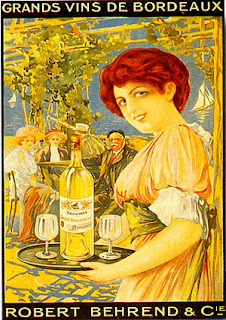 The wine is popular in both France (where it can provide up to 50% of the juice in Chateauneuf-du-Pape whites) and Spain (where the grape originated in the Priorat region). This is not a "white" version of a red grenache wine--it's a whole other grape. 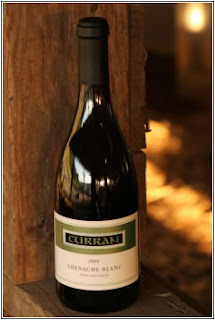 The 2005 Curran Grenache Blanc ($25.2o, Malibu Wines) is a very good QPR wine that is pale straw in color, with aromas of fresh peaches and apples. A slight spritz on your first sip is the preamble to flavors of ripe, round peaches and melons. As you swallow, you are left with a rich, juicy impression that is all fruit. While grenache blanc is often aged in barriques, Curran ferments in stainless steel and inhibits malolactic fermentation to highlight the fresh flavors of the varietal. This is a full-bodied white with a luscious texture--but none of that comes from oak. It's all from the high-quality fruit. I looked on the web for some suggestions of what to serve with Grenache Blanc and many sites mentioned pumpkin and squash dishes. 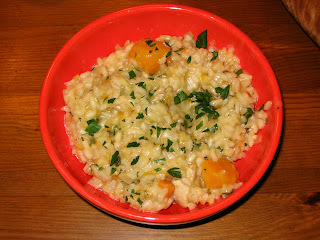 I decided to try David at Cooking Chat's recipe for a chicken and butternut squash risotto. He didn't post a picture of his dish, so I took a picture of mine. And I hope David will forgive me for swapping the garlic powder for minced garlic, and omitting the truffle oil which I didn't have in the house and couldn't face shopping for it! It was absolutely excellent, and its rich yet delicate flavors went perfectly with this full-bodied, soft wine. It would also be good with spicy, creamy dishes like Thai and Indian curries, or with traditional French bistro fare. Kris's wines were recently featured at a wine-tasting dinner at Akbar in Santa Monica, where the 2005 Grenache Blanc was paired with an Indian fish dish, confirming my sense that the wine would go as well with spicy fare as it did with my risotto. 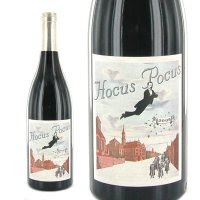 This is a special bottle of wine, and even if your normal wine ceiling is $20 every now and again it pays to go above it as long as the wine you are purchasing is of sufficient interest and quality. This one is. There are quite a few bottles of this wine available through retailers (check WineZap for one near you, or one that can ship to you). Curran also has an email list to notify customers of upcoming releases and allocations, in case you want to explore her syrah and other wines.